We are very much enjoying being reviewers for the 45th Anniversary of The Very Hungry Caterpillar by Eric Carle. Next month the celebrations over on the official website www.eric-carle.com and on Facebook will come to a climax with lots of fun events and activities. This month my two girls have been reviewing Very Hungry Caterpillar activity books for babies and toddlers. The Very Hungry Caterpillar Touch and Feel Playbook is ABSOLUTELY perfect for Holly right now - this is her favourite kind of book. It is a large hardback book with lots of colours, shapes and textures for her to explore on every page. There are words about animals and weather and colours for us to share together and she really likes to sit down and explore each page in detail. There are a few lift-the-flap surprises too. It is a good sturdy book which is suitable for older babies, toddlers and preschoolers. I love this book and at £8.99 I think it is great value and likely to become as much a family classic as our traditional Very Hungry Caterpillar story book. This is The Very Hungry Caterpillar's Little Book. 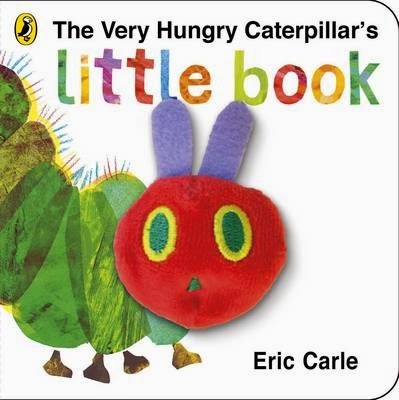 It is a small square board book which contains all of the coloured fruits that the caterpillar munches his way through during the week. Through the middle there is a big hole and from the back of the book there is a red plush finger puppet which can act as the munching crunching caterpillar as he munches through the book. Holly really likes finger puppet books and this has been a fun way of her learning the names and colours of the fruits as well as starting to talk about numbers together. I'd recommend this little board book for babies from birth up to about 3 years old. It costs £4.99.